Congress: Is India's Grand Old Party in terminal decline? Two years after a historic drubbing in general elections, the 130-year-old Congress party is showing few signs of revival. On Thursday, the nightmare continued, with the party losing Assam and Kerala in crucial state elections. Now the Congress rules in just six of India's 29 states - half of them tiny ones in the north-east - and supports a regional coalition in Bihar. Going by its performance in Tamil Nadu, it is taking a beating even as an alliance partner. It's a vertiginous decline for a party which was on the upswing after winning two consecutive general elections in 2004 and 2009 - for the first time since 1989 - and then frittered away the gains in a haze of corruption scandals and indecision. "There has been a serious shrinkage of the Congress," says political analyst Yogendra Yadav. "It is shrinking to less than a national party." On the stump, Prime Minister Narendra Modi of the ruling BJP has often spoken about making India "Congress free". The party is doing very little to prove him wrong. The Congress's biggest handicap is its oversize dependence on the Nehru-Gandhi dynasty which many believe is past its sell-by-date. The dominance of the family, critics say, hobbles nimble decision-making, perpetuates a feudal political culture, encourages sycophancy, stifles inner party democracy and smothers talent. Image caption Rahul Gandhi (right) is expected to take over the leadership of the party from his mother, Sonia Gandhi. Emasculation of regional leaders has meant the dynasty remains the party's biggest draw. Heir-apparent Rahul Gandhi has shown some spark in recent months in taking on the combative Mr Modi and his party, but many say a lack of pace, energy and focus that competitive politics demands may be costing his party dear. Last year Mr Gandhi went on a near two-month sabbatical and was supposed to return with ideas for reviving the party, but he is still seen as remote and "out of reach". 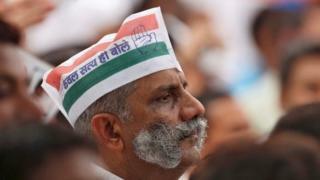 Party functionaries are desperately hoping that he takes over the reins from his ageing mother Sonia Gandhi this year. "The party's core problem is that it can neither dispense with the first family, nor, under current circumstances, live with them," says Pratap Bhanu Mehta of the Centre for Policy Research, a leading think-tank. There's also an inescapable perception that the Congress is tainted by corruption and blithely tolerates it. "It hobbles the party", Mr Mehta says, "in the sense of a decrepit old regime that presided over a vast network of privileges and corruption." Political parties with a rich and storied history do not fade away easily. Obituaries have been written for the Congress on at least two occasions in the past. But, in a fast-changing India of rising aspirations and more communication, the party needs, according to Mr Mehta, to "offer a new narrative of hope or tap into a deeper politics of anger" to take on its vigorous BJP rival, which revels in triumphal nationalism and is often accused of practising divisive politics. A new narrative will demand a new leadership and organisational reform. Isn't it ironical, says political scientist Zoya Hasan, that for many years the "world's largest democracy was managed by an internally undemocratic party". The party's centrist ideology, many say, has become feeble. A party of the fabled "middle path" which once claimed to represent every interest, is losing support in India's intensely fragmented polity. All is not lost. Party leader Shashi Tharoor insists that Congress "remains the most credible national alternative", and will "rise from the ashes". For all its faults, Ms Hasan says, the pluralist character of the Congress remains its unique selling point. "With all its faults it represents a non-parochial idea of India," she says. Can the party reclaim its idea of India? To begin with, it needs to bounce back by winning a big - and politically important - state. Gujarat, Mr Modi's native state and BJP's bastion, which goes to the polls next year amid what many say is rising dissatisfaction with the BJP-led government, would be a good beginning.